We have put this project off for as long as we possibly can. There was just no good place to put our life raft. We didn't want to give up all of the lovely real estate on the veranda by plopping this giant metal cradle with a big white box in it... But, we had no choice. We bought the thing, we need to mount it somewhere. I guess to complain that we have TOO many opening hatches on our deck to find a spot would be an insult to those who don't, so we finally ran out of time and excuses... we had to pick a spot to drill holes in our boat. 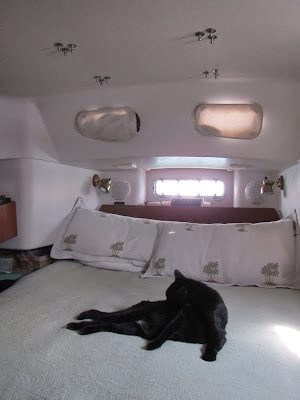 I marked the center line of the aft deck and we placed the cradle where it would least encroach upon our living space. We marked where the four feet would be placed and Bruce began drilling holes. The cradle had to be absolutely still while Bruce drilled, so I put my weight into keeping it in place. He drilled through the feet so that the holes would be as nearly perfectly placed as possible. We weren't entirely sure that the feet were identical. Then he removed the cradle and drilled each hole again, with a larger sized bit to make oversized holes. 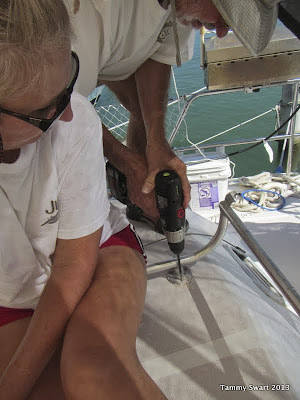 The plan was to drill through the fiberglass deck and the balsa core, then stop before drilling through the cabin top. We got to the very last hole and the drill popped through the inside layer! OOPS! No worries, we taped a nickel over the hole. We didn't want the inside holes drilled yet because we planned to fill the holes with epoxy and didn't want it coming in. It needed to create an epoxy plug through which we would drill the smaller holes for the bolts to go through. This would keep any moisture that would possibly seep into the bolt holes from reaching the balsa core. 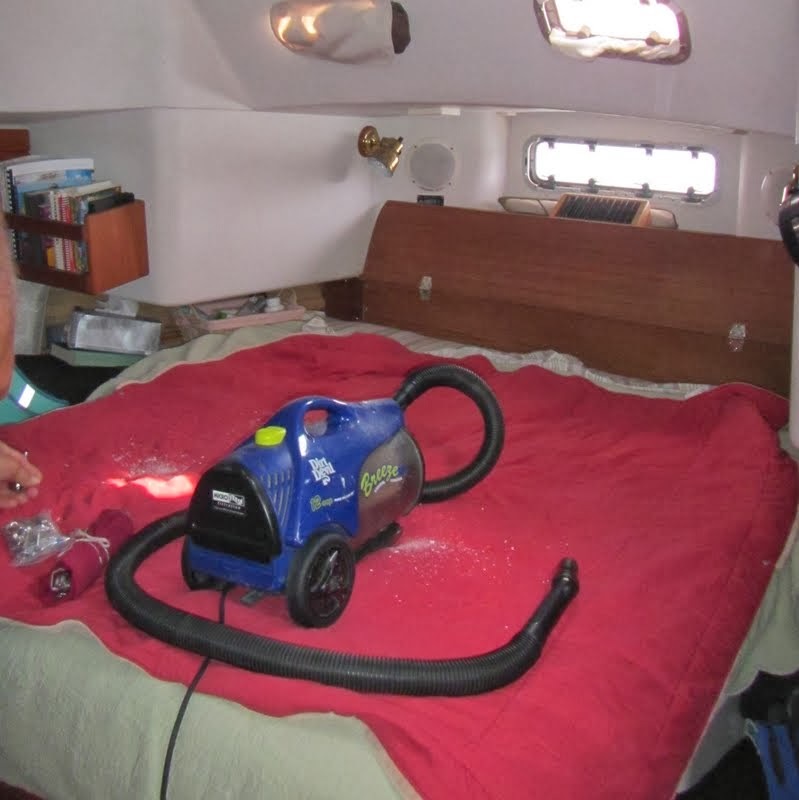 We made an emergency phone call to a friend who is both a sailboat owner and an engineer... He advised that it would be fine if we used a thickened epoxy such as West Systems Six-10 to fill the holes and make an expanded glob inside the airspace. Luckily we were able to find some, but not enough. We postponed our project until the next day. 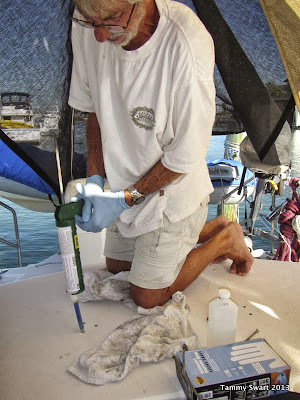 The following day, underneath the shade of our aft deck awning... we finished applying the epoxy. It took four tubes of Six-10, but we took that as a good sign that the epoxy was actually going down into the airspace and spreading somewhat. Fast forward: The epoxy has cured and we move on to the final steps. I used a punch to make a small divot in the center of each epoxy plug so that when Bruce started to drill, the bit wouldn't "walk". We wanted the bolt holes to be as close to the center as they could be so that he would drill only epoxy. Next, we fit the cradle back on. It only goes one way as the four feet are not identical. Good news! The feet fit precisely over the holes with the divots in the exact centers. Bruce drilled one hole for each foot and dropped the bolt through to keep the cradle steady while he drilled out the remaining holes. I sat on the cradle once again to keep it steady. I was happy to see that the only stuff coming up from the drill holes seemed to be epoxy. This means that we hadn't hit wood. Relief! 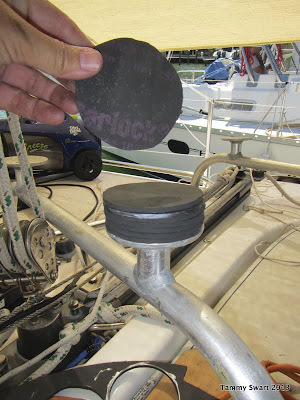 Our balsa core should be safe from water ingression. Next we needed to fit the rubber foot pads and drill the holes. We then assembled all of the parts to make sure it all fit together. We decided to use only one rubber pad for each foot. Two would have set up too high and were not really necessary. I prepared and placed Butyl tape pieces for each foot pad. While I did that, Bruce and Jezabelle filled the bolt holes with Life Calk. We hope that between the two, there will be far less chance of any water getting into the holes. Why is it always at the point that we are using sticky stuff... that Jezabelle chooses to appear on the scene? Once the foot pads were prepared, we lowered the cradle onto the prepared surface of the deck. The bolts went right into the holes and with a little encouragement, we had them all snugged down and seated. Bruce went below to apply the washers and nuts. I held the bolt tight from the top while he wrenched them from below. I watched as the butyl tape was squeezed out the sides. Perfect! Bruce removed the excess butyl with a knife and we repeated the squeezing process a second time, further tightening the bolts. Suddenly, we were finished! All we needed to do was to put the life raft back in the cradle. It turned out really well and wasn't as difficult as we had feared. We feel really good about the water seal. The bolts are solid and the thing doesn't move. Now back to inside... My fear that it would be really awful looking was not realized. I'm not saying that it looks nice... I would rather not see it at ALL. But once Bruce put the bolt caps on, it was not so bad. The part of the bolts that show are a bit uneven due to the differing thickness of the cabin top, but hey... We intend to have stainless steel backing plates made, but have run out of time for that now. So... It isn't perfect but we aren't professionals. We are happy with the result so that's what matters. All I need to do now is make a cover for the liferaft and it will make a very nice coffee table for our veranda.